Programmes Enhancers Protein Solutions Formula 1 Shake Mix Customer Reviews Preparation & Storage What's My BMI? 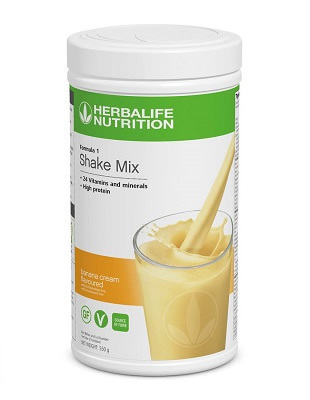 Formula 1 offers convenience, taste and nutrition all in one shake. Featuring a perfect blend of high quality protein, fibre, and vitamins & minerals you no longer have to choose between healthy meals and convenience - the Formula 1 shake is quick and easy to prepare! Get the nutrients your body needs, while staying committed to your preferences or diet requirements. F1 Banana Cream is made of ingredients that are vegan sourced, gluten free and contains no artificial colours or flavours. High in protein contributing to a growth in muscle mass, Formula 1 is a meal replacement that contains key micro and macro nutrients and added botanicals and herbs. Enjoy Formula 1 as a nutritional breakfast, lunch or dinner to support your active lifestyle and body goals. Vegan ingredients, gluten free, no artificial colour and natural flavouring. Blend or stir 26g (2 heaping tablespoons) of Formula 1 with 250 mls of semi-skimmed milk (low fat) or low fat soy milk. Create recipes by adding fresh fruit and ice. For weight control: replace two meals per day with this delicious shake and eat one nutritionally balanced meal. For healthy nutrition: Replace one meal per day with Formula 1 shake and eat two nutritionally balanced meals. This product is intended for use as part of an energy restricted diet and with other foodstuffs, in conjunction with regular physical activity.